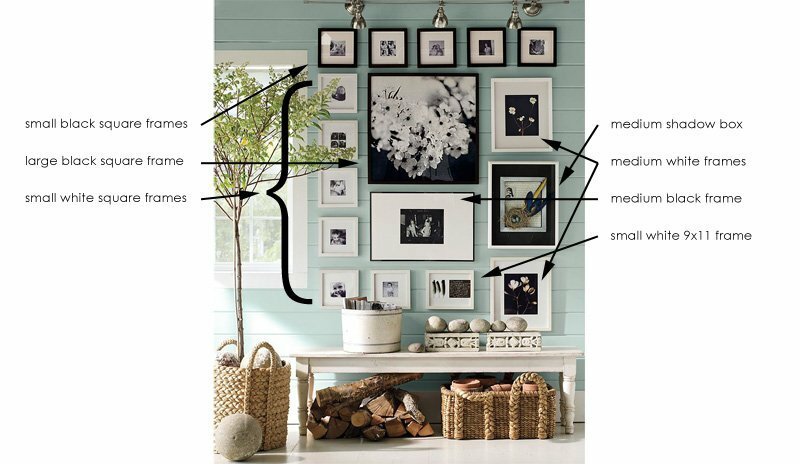 Create an organized photo wall that is easily updatable and mixes family photos and art. Put all your images into their appropriately sized frames. You’ll want your largest, statement photograph to set the tone of the room and your photo collection. Lay your framed photographs out on the floor to start working on the layout. You’ll want to start with the largest piece and work out from there. Above it will go a horizontal row of five small black square frames, hung level to each other and spaced about two inches apart. Make sure that left edge of the second frame from the left lines up with the left edge of the largest photograph to insure a sense of order and symmetry. Next you’ll put a vertical row of five small square white frames below the small black square frame in the upper left, again make sure they are all lined up nicely and spaced about two inches apart. About two inches below your large square frame centre the medium black frame. Beneath your medium black frame line up your remaining small square white frame with the left edge, and your small white 9 x 11 inch frame with the right edge. Make sure these two frames line up with the small white frame in the lower left. Almost done! Just three pieces left. One of the medium white frames is going to go to the right of the large black square frame so the top edges line up and you may want to line up the right edge with the right edge of the last small black square frame in the top row (but this comes down to personal preference, so play around with it and see what you like). The second medium white frame is going to line up with the first but it’s going to go in the lower right corner so that the vertical centre of it lines up with your small white 9 x 11 inch frame. Then centre your shadow box between the two medium white frames. Tweak your layout as you see fit, jostling the alignment and spacing and swapping photographs to create the most pleasing arrangement. Once you’ve got a design that you’re happy with get out a chair or ladder and photograph your composition. You know, just in case. Now you’re ready to hang your photos on the wall! This entry was posted in home decor and tagged contemporary art arrangement, displaying artwork, frames, framing, hanging artwork, home decor, interior design, modern, pottery barn, tutorial, ways to hang photos. Creating soothing art for busy people. Large modern abstract minimalist art prints for your coastal home decor. I believe that life doesn’t have to be busy in order to be full, rich, and beautiful. I’ve always had a unique way of seeing the world, often through rose-colored glasses, and always with an open heart. what is the space like? email me a photograph (with rough measurements), it may inspire a future blog posting. i’m back to this idea, jen! time to start collecting new frames for this wall, and the living room. Are you thinking above the couch? I like what you have there currently. Although this could work if you rotated it 90 degrees and maybe got rid of that top row of little frames. What are you thinking? for the kitchen, still. this weekend i think i’m going to pick up two 16×20 frames, figure out the custom matting, and then grab a few smaller ones to fill in the gaps. the living room is ok, though there’s a corner which is begging to be filled with art. and lake erie #9 has to come home with me. we’ll have to discuss! you’re welcome to come over and use my mat cutter if you like. can’t wait to see what you have planned! I can’t be trusted with such work, but any time you’re up for another visit, I’ll have the cheese platter ready! I would like to know the color of the wall ?